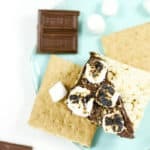 Make S’mores Rice Krispy Treats for a party to enjoy all the pleasures of camping in one easy, no-bake dessert. Cereal bars are dipped in melted chocolate, then topped with graham cracker crumbs and toasted marshmallows. Lightly spray a 9 × 9-inch pan with cooking spray and set aside. Line a baking sheet with parchment paper. In a saucepan over medium heat, melt the butter. Stir in the marshmallows and let them melt. Stir in the cereal and half of the graham cracker crumbs until well-coated. Press mixture into the pan and level with a spatula. (Spray the spatula lightly with cooking spray to keep the mixture from sticking.) Let cool completely, at least 1 hour. Once cooled, cut the bars into 16″ squares. In a microwave-safe bowl, melt the chocolate chips in 20-second intervals, stirring in between, until melted. Dip a corner of each bar in the melted chocolate. Use a knife or metal spatula to smooth it, if needed. Place on the prepared baking sheet. Sprinkle the bars with remaining graham cracker crumbs, then top with mini marshmallows. If desired, place the baking sheet under broiler for 3-4 minutes, checking frequently to avoid burning. Alternatively, you can use a blowtorch to scorch the marshmallows.